Huh. 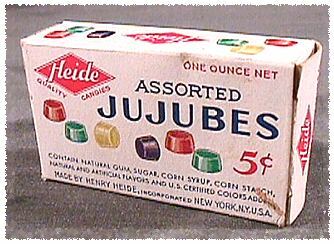 Did you know that the word "jujube" has been in use since the 1400s, referring to an Asiatic tree with datelike fruit, and that it has been a generic term for "soft fruit-flavored candy" since 1835? And here I thought it was a brand name. Learn something new every day! Stuck to your teeth and loosened your fillings. I still buy and love them. As for teeth, I buy them too. LOL. Another product that was secretly funded by the Dental Society. Great for the movies....stuck to your teeth bigtime !